The Ministry of New and Renewable Energy is implementing programme for installation of 1,00,000 of Solar Pumps for irrigation and drinking water through State Nodal Agencies and NABARD. This was stated by Sh. Piyush Goyal, Minister of State (IC) for Power, Coal & New and Renewable Energy in a written reply to a question in the Lok Sabha today. The Minister further stated that ministry provides 30% capital subsidy to farmers for installation of Solar Pumps for irrigation purpose through State Nodal Agencies. State Government may also provide additional subsidy through own funds. Ministry also provides 40% subsidy with mandatory loan to farmers for irrigation purpose through NABARD. The Minister further stated that Ministry has issued supplementary guidelines for 1,00,000 solar Pumps during 2014-15 and Rs.353.50 Crore was released to various agencies. Till now 63,436 pumps were sanctioned to various State Government agencies and 30,000 solar pumps were sanctioned to NABARD. 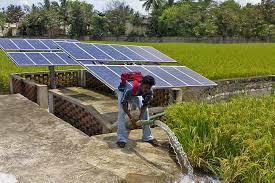 The State Governments are subsidizing Solar Pumps so that farmers take this up in a big way. MNRE has also made provision in guidelines for injection of surplus power in the grid so that farmers can get some returns on the investment. Ministry has empanelled 53 Solar Pumps System integrators to operate through NABARD and are providing training, the Minister added. The Government has already revised the National Solar Mission target of Grid Connected Solar Power projects from 20,000 MW to 100,000 MW by 2022. This was stated by Sh. Piyush Goyal, Minister of State (IC) for Power, Coal & New and Renewable Energy in a written reply to a question in the Lok Sabha today. The Minister further stated that Tariff Policy has been amended by the Government to require State Electricity Regulators to fix a percentage of energy purchase from solar power under the RPOs. As per amendment, the solar RPO has to begin with 0.25% of the energy procured in the State reaching to 3% by 2022. The Minister also stated that in order to achieve the proposed capacity of 100 GW target by 2022, the investment required would be around Rs. 6,00,000 crores (@ Rs.6 crores per MW at present rate) out of which about Rs 420,000 Crores is proposed to be debt sourced from both domestic and international financial institutions including multilateral and bilateral organisations. As on 30th June 2015, the cumulative installed grid-interactive solar power generation capacity in the country is 4061.64 MW. The States/UTs have to set up solar power projects or procure solar power to fulfil the Renewable purchase obligation declared by the respective Regulatory Commission. The Government has approved a plan to set up 2000 MW grid connected solar power capacity under phase II of JNNSM. One MW of Solar PV project generates 1.66 million units of electricity. The power thus generated will be fed to the grid which can be drawn by any consumer including households. The Minister further stated that the Government has launched a scheme for setting up 25 solar parks in the country wherein land, evacuation arrangement and common infrastructure will be made available for setting up solar power projects. By increasing the Tax Devolution from 32% to 42%, States have been given more financial flexibility to utilize the untied resources. This recommendation has come in support of the laudable objective of cooperative federalism emphasizing the need and role of strong States in our federal polity. This information was given by the Minister of State (Independent Charge) for Planning, ShriRao Inderjit Singh in a written reply in Rajya Sabha today. The Minister said that there is no doubt that the States have to assume a much larger and more important role in nation’s development. From time and again, States have stressed on various occasions the necessity of giving more resources, greater freedom and a stronger voice to the States, as a one-size-fits-all approach does grave injustice to the diversity of our country. Hence, being the elected Governments and sharing equal responsibility with the Central Government, it is believed that each State Governments will make best and efficient use of the untied funds available to them in different schemes including the schemes transferred to them. Shri Rao said that in the Union Budget 2015-16, eight Centrally Sponsored Schemes (CSS) have been delinked from support from the Centre with a view that State may decide to continue (or not) with these schemes out of their increased resources resulting from the recommendations of the 14th Finance Commission. The list of these 8 schemes is given in Annexure-I.The list of schemes, in which sharing pattern will undergo change and jointly being implemented by States and Centre is placed at Annexure-II and the list of schemes to be fully supported by Union Government is placed at Annexure-III. One of the flagship projects of Indian Railways namely Dedicated Freight Corridor continues to maintain implementation tempo. The Nodal PSU of Indian Railways entrusted with the implementation of this project namely Dedicated Freight Corridor Corporation of India Limited (DFCCIL) achieved yet another milestone by successfully awarding the System Contract for Bhaupur (Kanpur) - Khurja Section of Eastern Dedicated Freight Corridor (EDFC) Phase- I to AIL-ATSA JV. This section has a 343 kms. (Double Track) length. This contract has been awarded on Design Build lump sum basis at a cost of about Rs.1497 crore. The work involves Design and Construction of Electrification, Signalling, Telecommunication, Buildings and other associated works. The contract has been awarded through International Competitive Bidding Process. The work is funded by World Bank. The Electrification work includes Traction Power Supply, Over Head Equipment (OHE) and state of art SCADA for 2X25 kV System. The Signalling and Telecommunication work includes Automatic Signalling, Electronic Interlocking, Train Detection using Multi Section Digital Axle Counters (MSDAC), Train Management System, OFC based communication system, GSM-R based Mobile Train Radio Communication etc. The Building work includes Station Buildings, Operation Control Centre (OCC), Maintenance Depots and Residential Quarters. The Bhaupur-Khurja Section will have 10 stations at a spacing of 35-40 Kms of which 4 are Junction Stations connecting to Indian Railways for exchange of freight traffic. The system shall be designed to carry long Haul (1500 M.) Freight trains of 13000 tons at a maximum speed of 100 kmph and will improve the present average speed of 25 kmph on Indian Railway to 65 kmph. The contract for Civil Work is already awarded and the construction work is progressing at a fast pace. The complete Bhaupur – Khurja section is planned for opening during 2018. DFCCIL, a Special Purpose Vehicle (SPV) is engaged in planning, construction, operation and maintenance of the dedicated freight corridors and in the first phase, the two corridors, namely, Eastern Corridor from Ludhiana to Dankuni (1840 kms) and the Western Corridor from Dadri to Jawaharlal Nehru Port (JNPT) (1502 kms) are being constructed. The entire Western Corridor is being funded by Japan International Cooperation Agency (JICA), while the Eastern Corridor from Mughalsarai to Ludhiana is being funded by the World Bank. Union Minister of Chemical and Fertilizers, Shri Ananth Kumar and Minister of State (Independent Charge) for Youth Affairs & Sports Shri Sarbananda Sonowal here today flagged off 1st All Women Trans Continental Road Expedition from Delhi to London. The three women participating in the expedition will reach United Kingdom in 55 days via Myanmar, China, Kyrgyzstan, Uzbekistan, Kazakhstan, Russia, Ukraine, Poland, Czech Republic, Germany, Belgium and France. The all women team will be travelling in one vehicle without any backup vehicle. Speaking on the occasion, Shri Sonowal said that his Ministry has always supported new exploration and initiatives by the youth of this country, encouraging them to go beyond their limitations, push against artificial boundaries and reach new destinations. He said, the expedition demonstrates grit and courage of Indian women. Shri Ananth Kumar said, the expedition symbolizes the spirit of adventure of Indian women. He said, the expedition will encourage more and more young people especially young girls and women to feel inspired to undertake such explorations and the participants of the events will become role models for all.